The rises and falls of mid-major programs may not be nearly as dramatic as the WCW, but they are no less stark. They are also much more apparent and noticeable when that team is in the “fall” phase of the cycle. North Texas started that phase last season and it might continue this season. 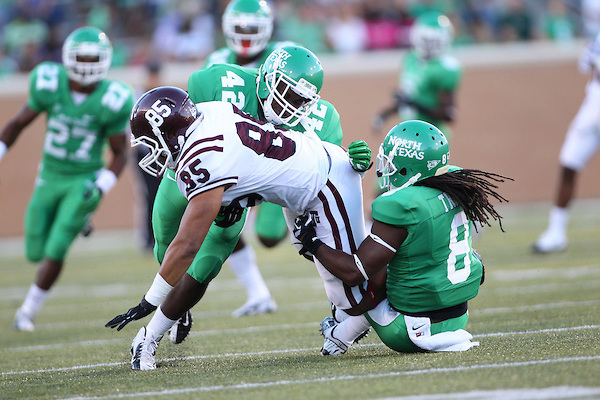 Having a true “go-to” guy is always nice, and the Mean Green has one in Carlos Harris. Harris is one of the top possession receivers in the conference. He caught 70 passes last season, which comes out to almost six receptions a game. There is not a whole lot of experienced help around him though. Expect solid return man Darvin Kidsy to take on a bigger role in the offense, and hopefully emerge as a true deep threat. 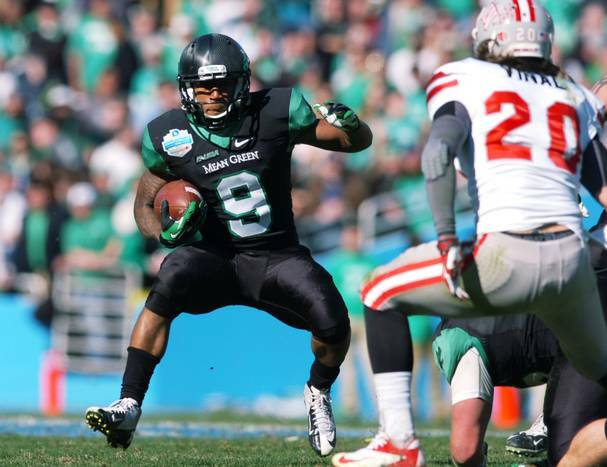 North Texas’ running backs weren’t a huge asset last year, but they weren’t a liability either. Fortunately, they also managed production in unlikely places. Former walk-on Erick Evans managed over 200 yards and 3 TDs on only 24 carries. As for the likely sources of production, leading returning rushers Antoinne Jimmerson and Jeffrey Wilson combined for around 800 yards and six touchdowns, which is not bad but not stellar, but neither of them fumbled so that’s a solid bonus. 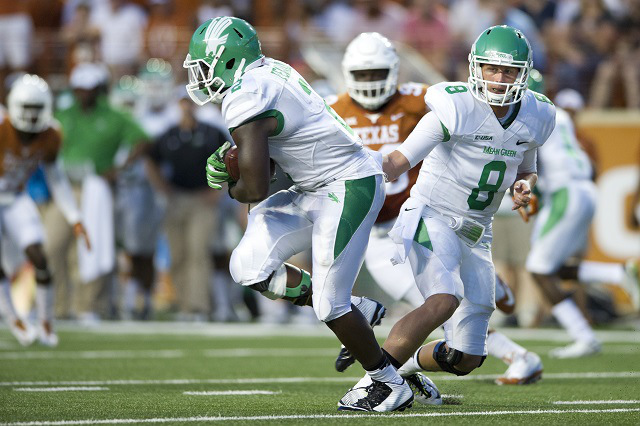 One of the big issues that North Texas faced was a continuously on-going quarterback battle. Those problems seem to be resolved as Andrew McNulty seized the job towards the end of last year, and carried that momentum over into the spring by winning the job in spring practice. A huge issue that still lingers for the Mean Green though is the line. Losing four starters always hurts, especially when three of them were four-year starters. Kaydon Kirby will have to step up at center, because with 25 starts under his belt he is by far the most experienced. No other player has started more than one game. Sacks were a relative strength for this team last year, and that should remain the case this year. Six returning defensive linemen had two or more sacks last year. The leader among them was Chad Polk with 4.5 sacks. He also pitched in 7.5 tackles for loss. They ought to be able to pin their ears back and go after the quarterback without fear of giving up too much on the ground, too. This linebacking group lost its most productive player in Derek Akunne, but everyone else is back. Even if this unit isn’t great is should be deep enough to stay fresh for the entirety of games and be at least passable. Hopefully the front seven can be passable too, because that would really take the pressure off of a young secondary. CB Kenny Buyers is the only returning starter in the secondary, but he was at least decent with two interceptions. One of the biggest sources of optimism though is JUCO transfer James Gray. Gray won the strong safety job in the spring, and recorded four interceptions in the junior college ranks in 2014. Growing pains are par for the course with Group of Five (the more politically correct way to say “mid-major”) programs. North Texas is no exception, but it really hurts to suffer growing pains and a brutal schedule in the same season. The Mean Green have to play the top three teams in the Eastern division (at least top three in the preseason) and two of them on the road. They also have trips to Tennessee and Iowa to look forward too. A home game against Portland State should guarantee at least one win, but other than that it will be tough sledding for the Mean Green.